When it comes to staying active, it’s an established fact that WASP’s prefer the great outdoors. Whether it’s on the course, the bay, or the courts, fresh air and sunshine are the name of the game. But wait, you may be asking, don’t most WASP’y types live in areas where the weather is not always/rarely conducive to outdoor sports? What about rainy days? Or February? What am I supposed to do then??? All excellent questions. Fortunately any WASP worth his salt will have the perfect answer: Squash. Not the gourd, the game! Squash is perhaps the definitive WASP indoor sporting activity. As such, if you want to live like one, it’s a game you’ll need to learn how to play. Unfortunately Squash isn’t very popular in America, where it’s been largely overshadowed by its redneck cousin, Racquetball. Today the average American’s exposure to the sport is largely limited to movies where Michael Douglas plays an investment banker. The good news however is that Squash is easy to learn, a lot of fun to play, and an excellent way to exercise. With that being said, lets get started with some history. The modern version of Squash (like most things WASP’y) is a product of the English. 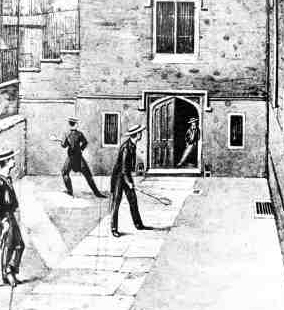 An early version of the game was actually developed at Fleet Prison, a notorious debtors prison located in London, where inmates created a tennis-like game called “Racqeuts”. To better adapt to the realities of prison life, where space and materials are at a premium, the game replaced the net with walls and made use of a simple, non-squeezable ball. 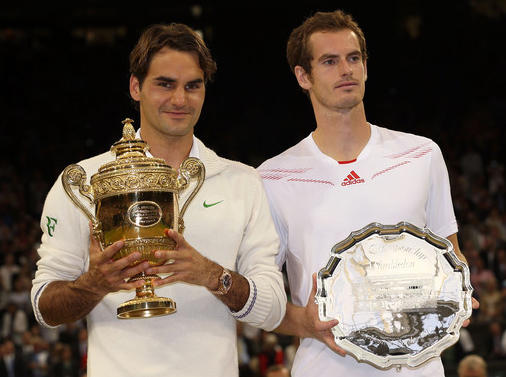 Over the years Racquets, and similar games, gained in popularity, especially in schools across England. Squash itself credited to the Harrow School in London, home to the world’s first purpose-built Squash courts. 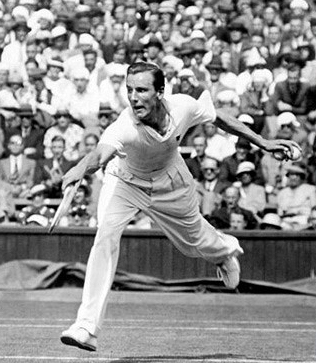 Students at Harrow developed many aspects of the modern game, including the use of rubber balls and modified racquets with a short reach, ideal for playing in a confined space. The game quickly gained in popularity and eventually found its way across the Atlantic in the late 19th century. During this time various sporting associations sprang up in an attempt to standardize the rules and regulations of the game. However, it was not until 1928 when the Squash Rackets Association formed to set the official standards for the sport we know and play today. Fortunately for you Squash shares a trait common with all great games: it’s easy to learn how to play (difficult to master being the other). The first step is getting to know the basic equipment. 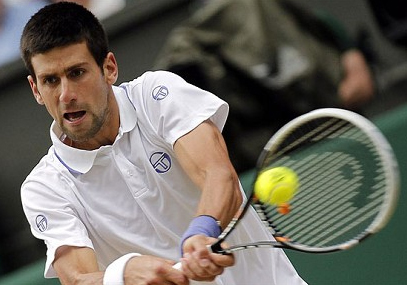 Racket: A Squash racket is a bit like a down-sized tennis racket, but with an elongated neck and a smaller face. The long neck is especially important as it allows you to generate greater swing speeds, a necessity due to the unique nature of Squash balls. 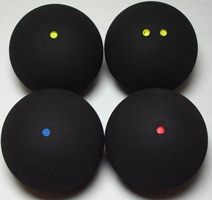 Ball: Squash balls are similar in size to a golf ball, hollow, and made from several layers of thick rubber material. Its most unique aspect is that unlike the balls used in most other sports, a Squash ball is not bouncy. Drop one from shoulder height onto a hard surface and it will rebound a few inches at the most. Safety Goggles: I know, they make you look doofy and are awkward to wear, but these are definitely a must have. Squash balls are routinely hit at 100mph+ speeds and as you just learned, when a Squash ball hits something the result is an inelastic collision, which means that a large amount of energy is transmitted to whatever that object may be. If that object is your leg or chest, it’s going to sting and leave a mark. If that object is your unprotected eye, you’re going to be blind… Wear the goggles! That’s about it in terms of dedicated equipment. Beyond that it’s simply a matter of wearing appropriate athletic attire and a good pair of gym shoes. Now, let’s get to know the court. Out Line: The topmost line on the front wall, sloping down along the sides, and running across the back wall. Like the name suggests, this is the boundary for all legal or “in” shots. Anything hitting on or over the line is out. Service Line: This is a line running roughly across the middle of the front wall and marks the lower boundary of the legal service shots (more on that later). The line serves no purpose after the serve. Tin Line: The lowest line running across the front wall marks the lower boundary of all legal shots. Below the line is a strip of tin that makes a loud, distinct noise when struck by the ball. If you hear that noise, the shot is out. Floor Lines: Mark service areas in the back half of the court. Like the service line on the front wall, these markings become irrelevant after the serve. OK, so you have the equipment and are familiar with the court. Now for the fun part, it’s time to play! 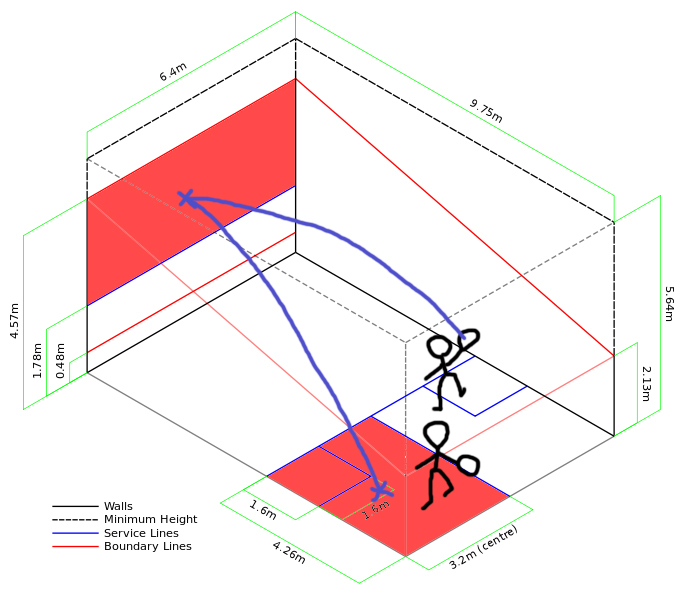 Each game begins with a serve, which can be determined by spinning a racket, flipping a coin, rock paper scissors, etc… To begin, the server must stand behind the line running across the floor with one foot completely within the smaller service box within his quarter of the court. He then hits the ball so that it 1) hits the front wall somewhere above the service line and below the out line and then 2) lands within the opposite rear quarter of the court as marked by the floor lines. 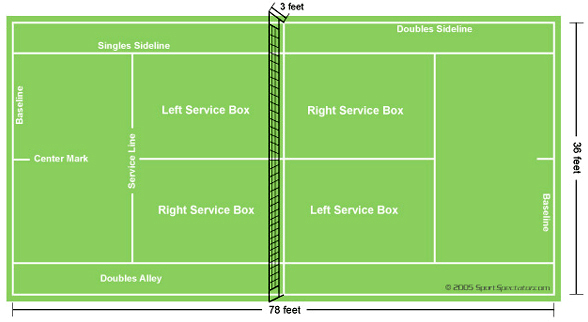 If the serve is legal, the returner can hit the ball anytime after it has struck the front wall, at which point play begins. From this point on, the rules of play are fairly simple. Players take turns hitting the ball until someone fouls and the point is over. For a shot to be legal it may hit the floor once and can then be played off any number of walls so long as it always hits the front wall last and remains within the line boundaries (below the outline and above the tin line on the front wall). Once a shot hits the front wall it’s the next player’s turn. The ball can again bounce off any number of walls, but only once on the floor before the return is hit. If a player fails to hit a legal return, then his opponent gets the point. 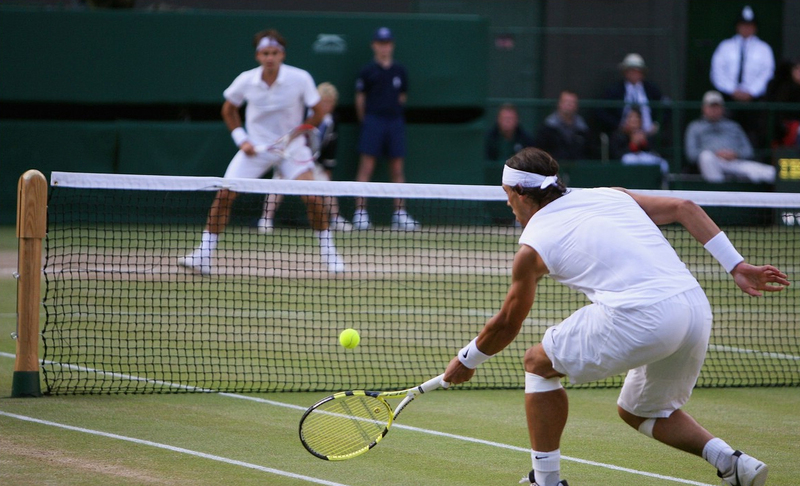 If the server wins the point, the players switch sides and he serves again. 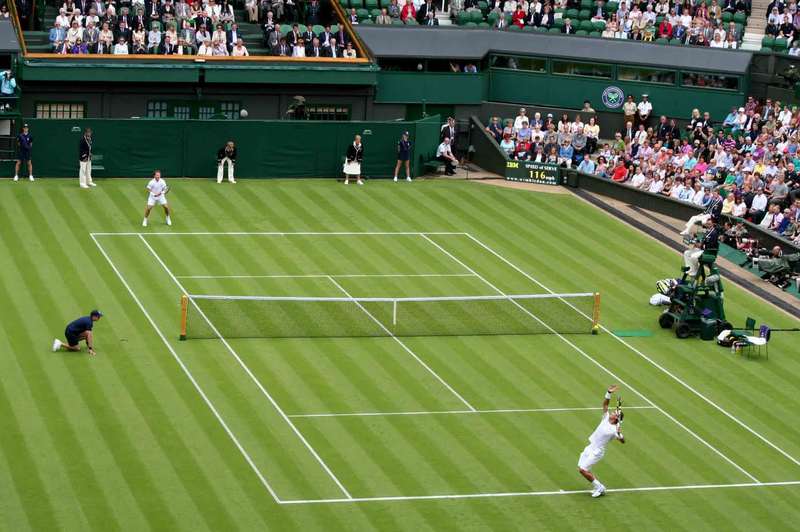 If the returner wins the point, players remain on the same side while service transfers. One of the fun aspects of Squash is being about the use the entire court to play shots and as such, situational awareness is key. Knowing where to be, and where not to be, can make all the difference in a game. 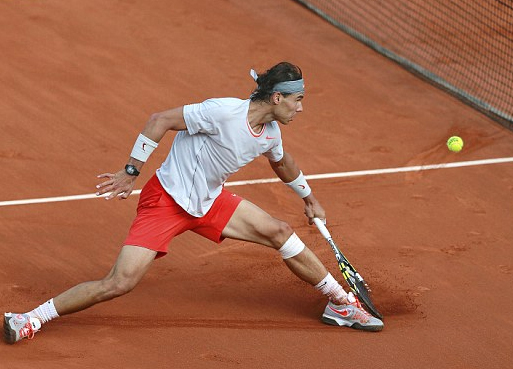 In the case of the latter, know that if you get in the way on an opponents shot, it will cost you a point. It will also probably leave you with a nasty mark. However, that being said, it is not legal to deliberately aim shots at your opponent! As a general rule, incidental interference usually results in a let (do over), more obvious interference in a point. Games are played to 11 points, but must be one by 2. Competitions are generally played out of a “best of” series consisting of 3, 5, 7, etc… games. That’s pretty much it. Simple right? Well as I said earlier, like all great games, learning to play is easy. Mastering it could take you a lifetime. Go out and buy a squash racket, balls, etc… Most major sporting good stores will carry Squash equipment and the good news here is that since Squash is so unpopular in America, you can get great deals on the merchandise! You can usually find a decent entry level racket for under $30 and the balls are only a few dollars a piece. Find a Squash Court. This can be a little more difficult for the same reason you can find deals on Squash equipment, the game is just not that popular in the US. A lot of places have Racquetball courts, but very few have Squash courts. 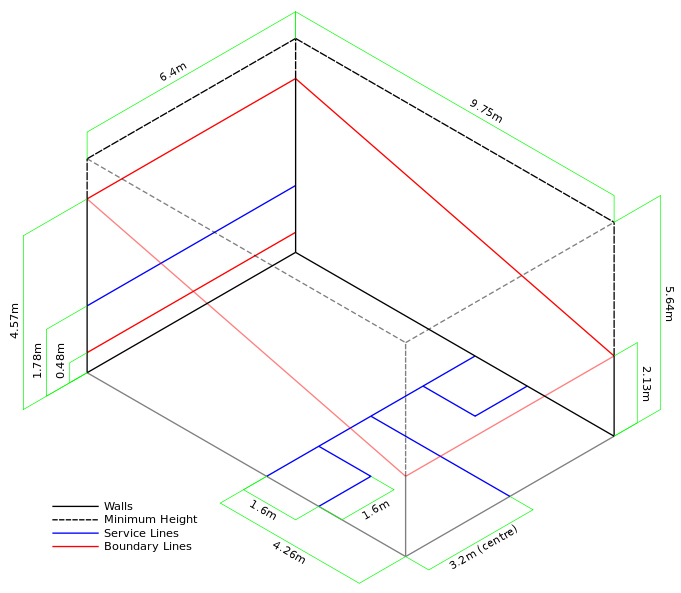 While it may be tempting to use a Racquetball court instead, resist the urge as the two are just too different in terms of dimensions. In a pinch you could use a Racquetball court for basic practice, but that’s about it. If you look, most cities have at least one community center that offers Squash courts. 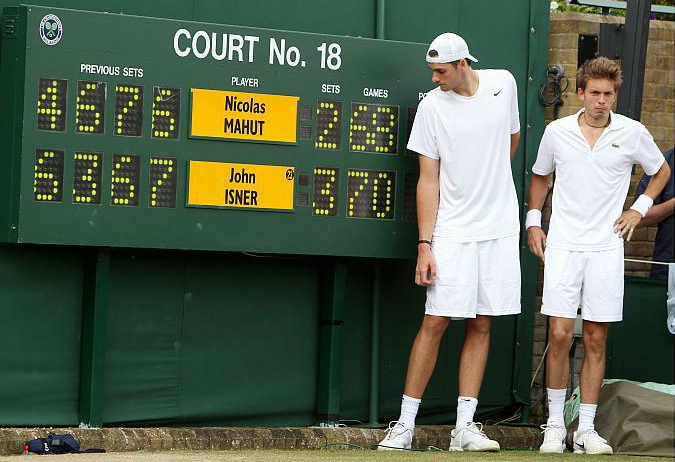 On the plus side, if you do find one, there’s generally less competition for court time. Learn more about the sport at the World Squash Federation website. Watch people play on YouTube. Get a friend and play!